When it comes to Thai food, first thing comes to our mind is the explosion of flavor from lemongrass, kaffir lime, thai basil, holy basil, and the strong sharp smell of fish sauce and of course the heat from fresh red chilies. For this fried rice I used Thai basil as the key ingredient. Thai basil leaves are much narrow leaves with purple veins and stem, widely used in Thai cooking along with holy basil (tulsi). It has its beautiful aroma, very difficult to describe, but once you use them will absolutely love this herb for sure. While cooking with Thai basil make sure not to cook it for a long time, or else it will lose its beautiful smell. A bunch of Thai basil was sitting in my pantry. The original plan was to prepare my favorite Thai red curry with chicken, unfortunately for some reason it didn't happen. 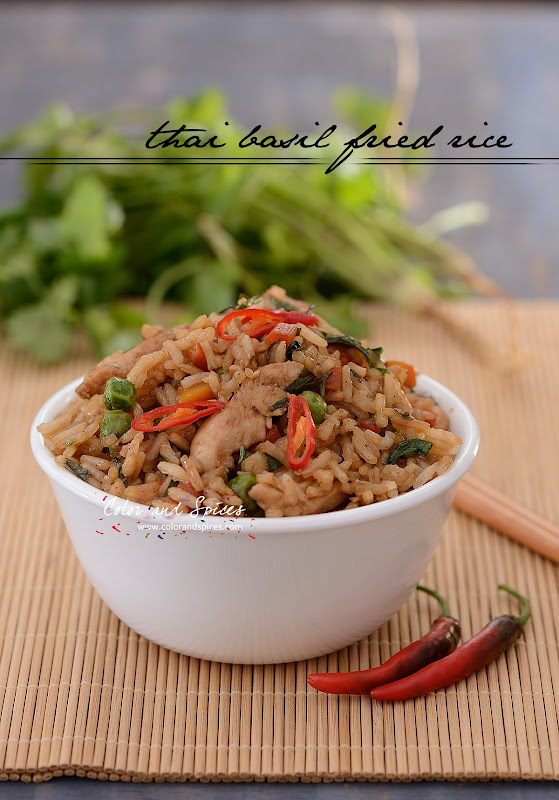 But how could I waste those fragrant leaves, so came up with this idea of using them in a Thai basil fried rice. This fried rice takes very little time to cook. I used previously cooked jasmine rice, any good quality long grain rice is good for this dish. 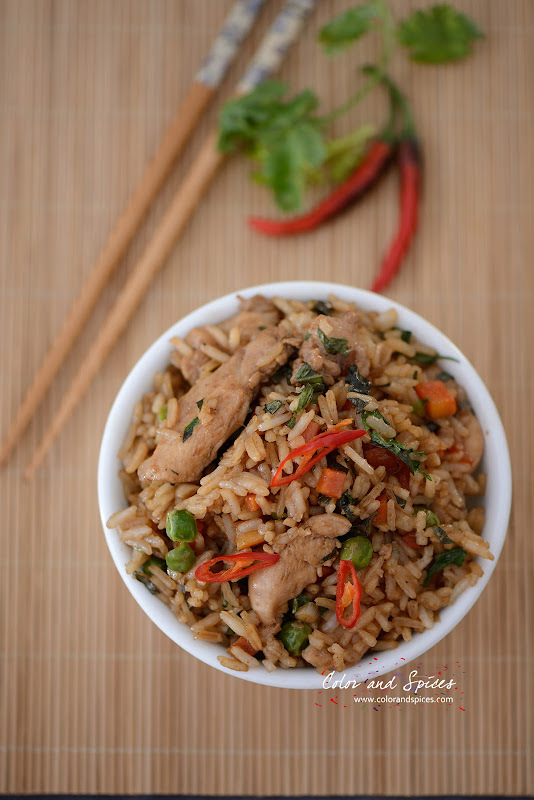 If you are using freshly made rice, make sure the rice is completely cooled down before adding it to the wok. I used chicken as the protein to my dish and for the veggie quotient I added a handful of green peas and diced carrots. 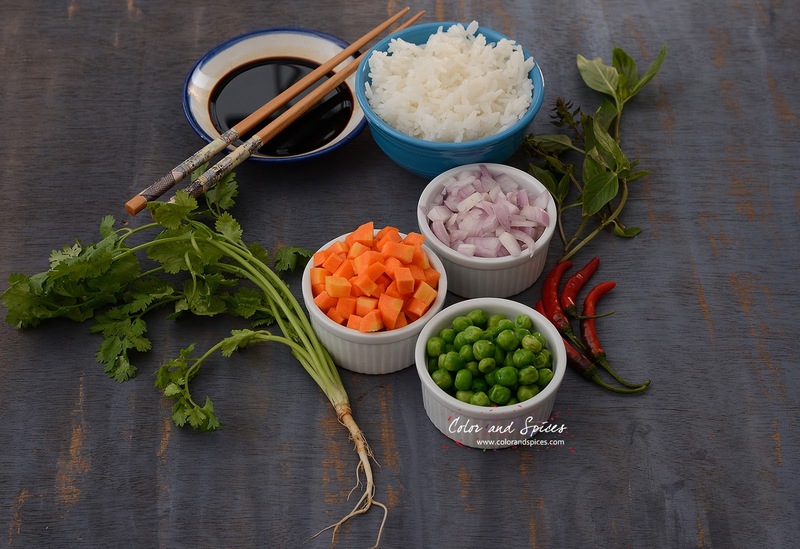 Prawns, broccoli, beans, are some other options can be used in this fried rice. 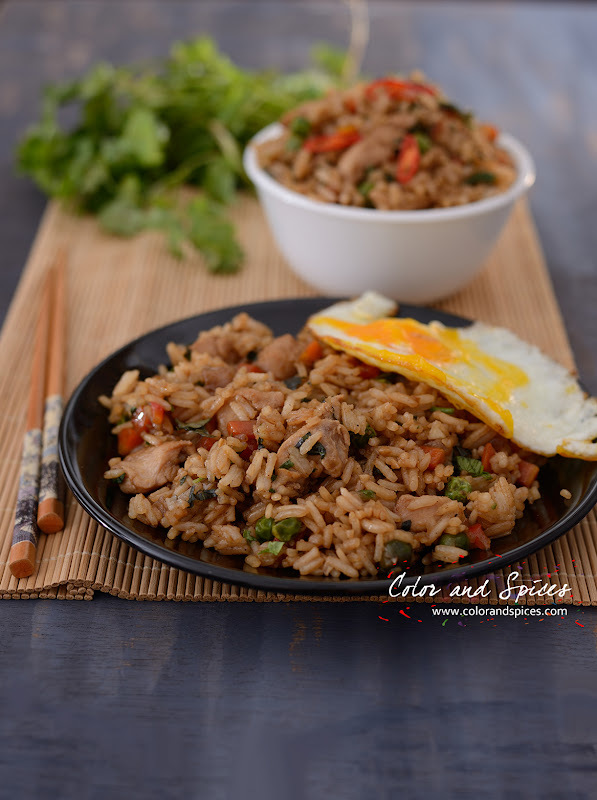 This Thai style fried rice is a bit spicy, to bring the heat I used fresh red chilies. The dish gets the distinct flavor from fish sauce and Thai basil. If you don't have fish sauce in your pantry, I insist to have one immediately, you don't know what you are missing. 1. Wash and pat dry the chicken breast, cut into thin strips. Marinate the chicken strips with salt, black pepper powder, 1 teaspoon dark soy sauce, 1 teaspoon sesame oil for 15 min. 2. In a wok heat oil, cook the chicken strips over high heat for 2-3 min, take out and keep aside. 3. Add little oil to wok, I use use the same wok (just wipe it with a kitchen towel to make sure there is no pieces of chicken left). When the oil is hot, add the garlic, cook for 1 min. Add chopped onion and carrot, sprinkle a little salt and cook. when the carrot turns a bit tender add the green peas. I used frozen peas, if you are using fresh green peas then blanch them before using them. Add chopped red bell pepper, cook over high heat for 2-3 min. 4. Add chicken pieces, sesame oil, soy sauce, fish sauce, brown sugar (white sugar can be used), fresh red chilies, mix well, add cooked rice. Add salt if needed. Fish sauce is very salty so be careful before adding extra salt to the rice. Cook over heat for 1-2 min, keep tossing the rice, taking caring not to break the grains. 5. Reduce heat, add Thai basil and coriander leaves, mix well. Switch off the heat. 6. Serve with a fried egg and thickly sliced cucumber.